Its been a while since I baked with Gayathri's Baking Eggless Group. The August challenge was difficult and September challenge had too many steps. I couldn't get them right, so saving the recipe for later I decided to move on.. 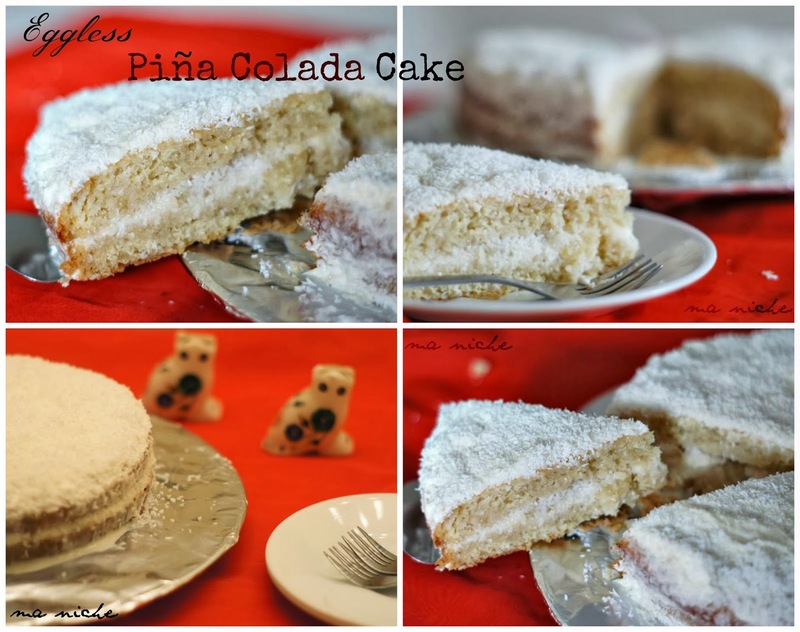 In October Meena Thenappan of Chettinad Fiesta challenged us to bake this beautiful Pina Colada Cake. According to me, the real deal of the challenge was to make an "eggless sponge cake" and then infuse it with the flavors of Pina Colada. While I have baked many eggless cakes before, I hadn't yet tried a eggless sponge cake, so I took this challenge seriously. Initially I tried tweaking a couple of standard sponge cake recipes but that did not go too well. So finally I had to resort to a tried and tested recipe. I chose this eggless sponge cake recipe from My Diverse Kitchen, adapted the methods slightly and viola... I had a lovely moist eggless sponge cake in hand ! Once the cake was made impregnating it with the flavors of Pina Colada was an easy job. I simply sliced the cake in half, soaked each half in a coconut cream solution, sandwiched a pineapple-coconut layer between them, then slathering the cake generously with Cool Whip whipped cream, I sprinkled coconut powder on top and thats it... my Pina Colada Cake was ready to go... The final product was really delicious. I can easily imagine myself making this cake for special occasions. It is a lovely dessert that is sure to please everyone. * I did not measure the amount of Whipped Topping and coconut powder used. Grease a 9 inch round pan and preheat the oven to 375 degrees F.
Sift all the dry ingredients except the sugar into a bowl and keep it aside. Put the milk and butter is a saucepan and stirring constantly heat it over medium heat until the butter melts. Switching off the heat, stir in the water, rum and granulated sugar in the milk-butter solution. Mix well until the sugar dissolves in the liquid. Then let the mixture rest till it has cooled down. Gradually add the dry ingredients to the cooled down milk-butter-sugar mixture and beat the ingredients lightly till a smooth uniform batter is formed. Now stir in the lemon juice and pour the batter into the prepared cake pan. Bake it in the preheated oven for 22-25 minutes till a fork inserted in the center of the cake comes out clean. Let the cake cool slightly before proceeding ahead. To prepare the soaking liquid, pour the contents of the chilled cream of coconut in a mixing bowl and using a hand mixer beat it till it looks thick and creamy. Add powdered sugar and cornflour to it and whip again. Stir in the rum and let the whipped cream chill in the refrigerator till ready to soak the cake. Once the cake has cooled down slightly, slice it into halves and spoon the soaking liquid over the two halves. You will only need one-third or so of the soaking liquid for this. Save the rest and proceed to make the pineapple filling. Put the pineapple slices, spiced rum and soaking liquid in a saucepan and simmer it over medium heat most of the liquid has evaporated. Spread the pineapple filling over the lower half of the cake, top it with a generous spread of Cool Whip whipped cream, sprinkle coconut powder uniformly on top of the Cool Whip layer, then place the other half of the cake over it. Now spread Cool Whip whipped cream on the surface of the cake, sprinkle coconut powder uniformly on top of the whipped cream, then transfer the assembled cake into the refrigerator and let the whipped cream set on the cake. 3 hours later, take it out from the refrigerator, cut a slice and enjoy !! Hope you'll try this recipe and enjoy it as much as we did. To see what the other members of Baking Eggless Group have baked visit Gayathri's Cook Spot . This awesome Pina Colada Cake is also my entry for this month's Spiced Rum Spiked Recipe Challenge by Carrie and Julie. Visit This Gal Cooks and Frugal Foodie Mama to find out what the others have made. Wow. This is a treat for pinacolada lovers. So well prepared and explained. Can the rum be dropped out or is it a required ingredient? You can definitely leave the rum out or substitute it same amount of coconut milk.. the flavors of rum did not show up at all. wow very very delicious and moist pina colada :) love the eggless version dear !! This is a great challenge and you certainly came up with a delicious response. 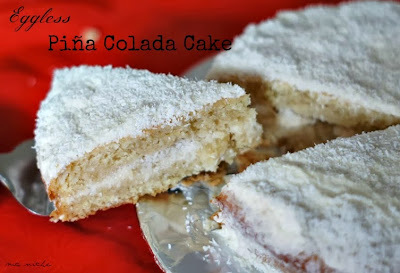 I am a pina colada fan and I know I would bite into this cake with enthusiasm. Thank you for sharing at Mix it up Monday! Where is your print button, all sites have them but, where is yours? This looks like a wonderfully flavorful and light cake. Thank you for sharing it with us on foodie friday. 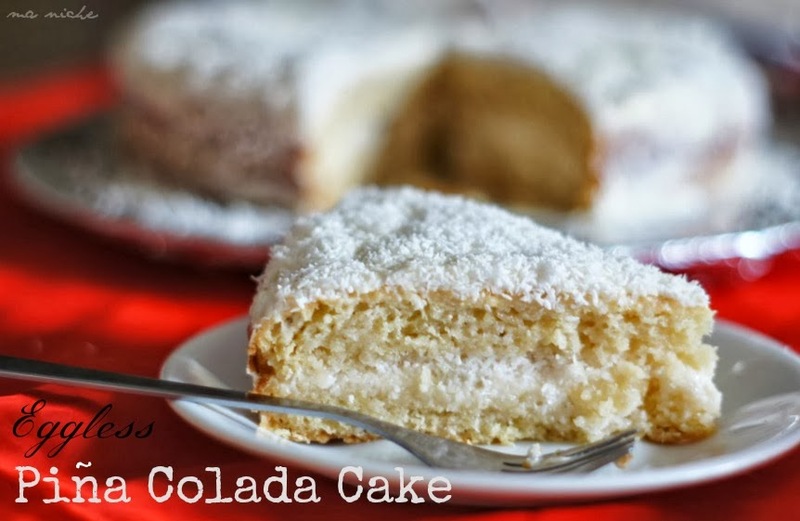 Your Pina Colada Cake looks delicious! Thank you so much for taking the time during this busy season to share your wonderful post with Full Plate Thursday. Have a wonderful weekend and hope to see you again real soon! This cake looks delicious! And the pina colada flavors with spiced rum? Yum! This cake looks delicious, I can imagine it taste very tropical. Thanks for linking up to Sweet and Savoury Sunday, stop by and link up again. Have a great day! !